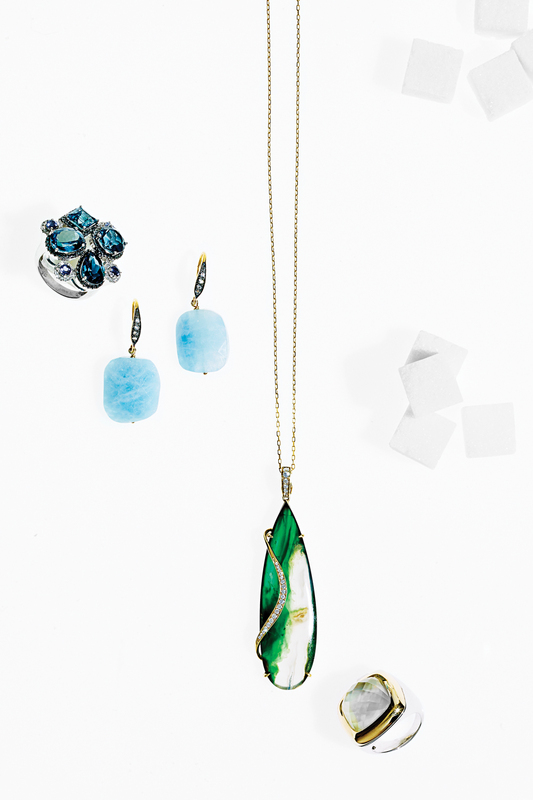 Sport this trending blue— Pantone’s serenity—in a white gold and blue topaz ring and drop earrings by designer Lisa Nik. 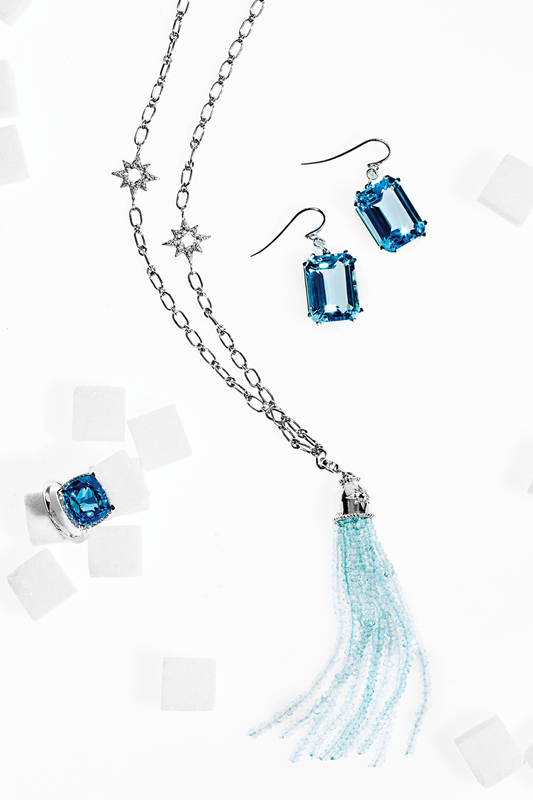 For added flapper flair, continue this “Rhapsody in Blue” with a sterling silver and aquamarine tassel necklace by Anzie. All available at Rose Jewelers in Southampton, (631) 283-5757. Everyone loves a little arm candy. 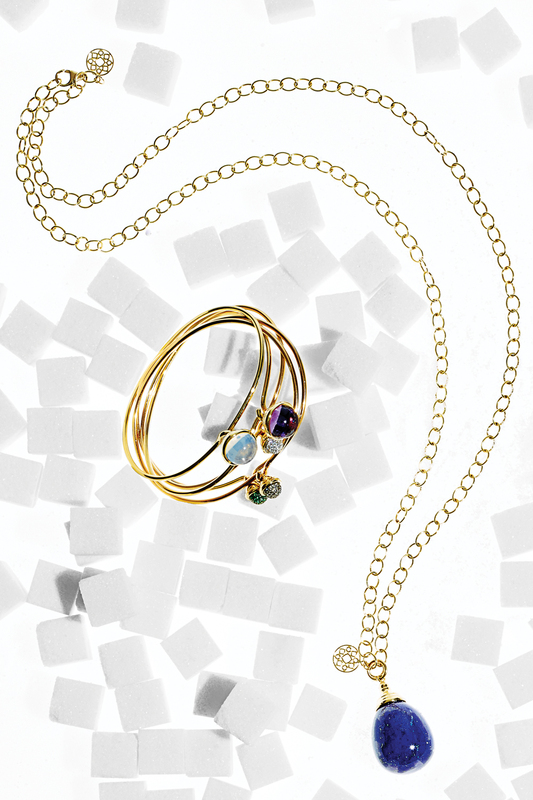 Customize a stack of 18k gold bangles by Syna with colorful spheres of gemstones like moon quartz, amethyst and diamond or tsavorite pavé. A globular pendant of lapis lazuli, also by Syna, rounds out the eclectic look, perfect for pairing with a crisp white tunic and a favorite pair of jeans. All available at London Jewelers, Americana Manhasset, (516) 627-7475. 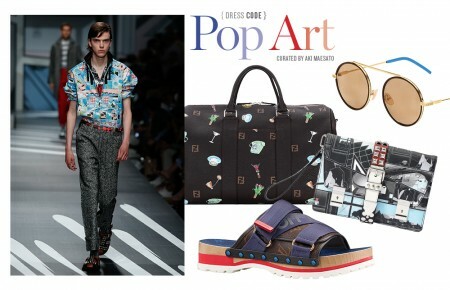 Up the ante on a statement piece by giving it a companion. The key is to choose a pair that’s complementary, not matchy-matchy. Blue topaz ring, accented with iolite, white and black diamonds and 18k gold and sterling silver earrings by Margo Morrison with faceted aquamarines and white sapphires available at Fortunoff Fine Jewelry in Westbury, (800) 636-7886. Agate and diamond pendant by Frederic Sage and Tirisi 18k gold and sterling silver ring with mother of pearl and crystal at Le Joaillier Fine Jewelry in Locust Valley, (516) 759-1133. 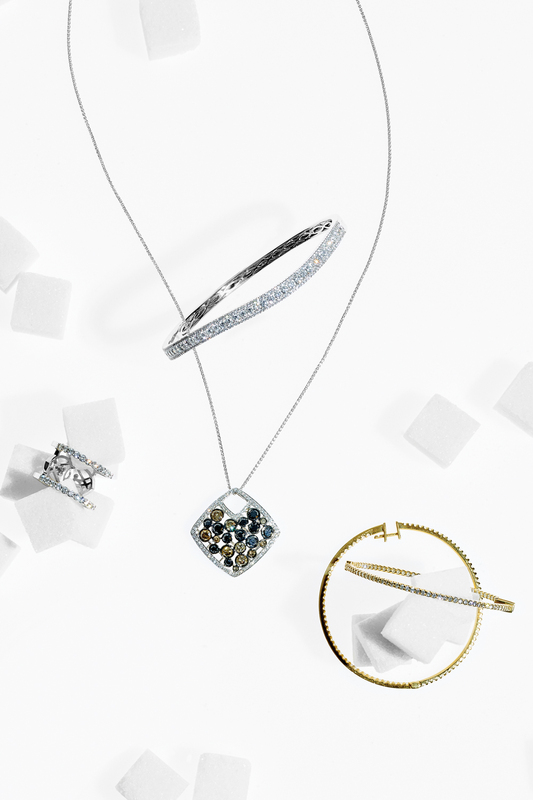 Slender, dainty jewelry is de rigueur—pencil-thin pieces are just made for layering. A double-decker white gold and diamond ring has twice the impact, especially when worn beside a diamond bangle with a subtle bend. Delicate and colorful, an openwork pendant of black and white gold, diamonds and gemstones adds an unexpected pop to even the simplest of outfits. Thin diamond and gold hoops are large enough to call attention, yet slim enough to still appear graceful. All available at Devotion, Roosevelt Field, (516) 415-5800.